La bande originale de “Dans l’ombre de Mary : la promesse de Walt Disney”. Sortie : 10 décembre 2013. Film : Dans l’ombre de Mary : la promesse de Walt Disney. 1. Chim Chim Cher-ee (East Wind) (par Colin Farrell) – 1:04. 2. Travers Goff – 2:06. 3. Walking Bus – 2:10. 4. One Mint Julep (par Ray Charles) – 1:31. 5. Uncle Albert – 1:34. 7. The Mouse – 0:57. 8. Leisurely Stroll – 1:34. 9. Chim Chim Cher-ee (Responstible) (par Emma Thompson, B.J. Novak et Jason Schwartzman) – 0:26. 10. Mr. Disney – 0:35. 11. Celtic Soul – 1:20. 12. A Foul Fowl – 2:04. 13. Mrs. P. L. Travers – 1:16. 14. Laying Eggs – 1:08. 15. Worn to Tissue – 0:54. 16. Heigh-Ho (par The Dave Brubeck Quartet) – 2:11. 18. Impertinent Man – 0:38. 19. To My Mother – 3:44. 20. Westerly Weather – 1:56. 21. Supercalifragilisticexpialidocious (Emma Thompson, B.J. Novak et Jason Schwartzman) – 0:05. 22. Spit Spot ! – 1:49. 23. Beverly Hills Hotel – 0:38. 26. Let’s Go Fly a Kite (Bradley Whitford, Emma Thompson, B.J. Novak, Jason Schwartzman et Melanie Lawson) – 1:55. 29. The Magic Kingdom – 1:05. 30. Ginty My Love – 3:12. 31. 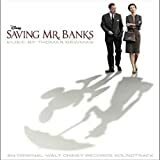 Saving Mr. Banks (End Title) – 2:12.